Watch the latest blockbusters and sporting events at Reel Boutique, Rove Downtown’s very own cinema. Get away from the crowds and enjoy a stress-free theatre experience at our cosy, 46-seater cinema room. Also available for private events and screenings, it’s the perfect venue for your next corporate gathering. After a busy day of Roving around the city, Reel Boutique is the perfect place to spend a chilled evening watching a good movie and munching on some popcorn. There’s no place Rovers would rather be after a day of adventures than in our cosy seats watching Hollywood hits and international flicks. Rovers can watch the latest hit flicks at Reel Boutique. Reel Boutique at Rove Downtown is a licensed cinema so you and your friends can enjoy grape, hops and bubbly at this hotspot. Got a birthday or special event coming up? Come on down to Reel Boutique at Rove Downtown where you, your friends and family or colleagues can have the screen to yourselves for private screenings. Ideal for business events, the comfortable yet functional cinema can host corporate gatherings, keynote talks, conferences, and TED-style talks. Enjoy stress-free self-parking at Rove Downtown. Our intimate and cosy screen has 46 comfortable seats to kick back in. 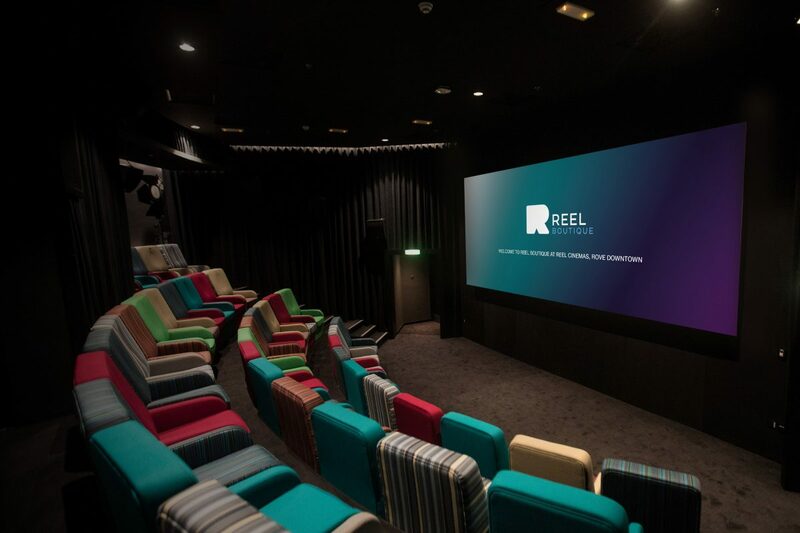 Take your cinema experience to another level with Reel Boutique’s state-of-the-art technology and audio-visuals like no other. We want all Rovers to enjoy the full cinema experience so your ticket comes with popcorn and a soft drink.